When they’re great, the correct pair of glasses perfectly complements your face and seamlessly facilitates your experience of the visual world. When they are not the right prescription or hastily chosen, glasses can be uncomfortable, cause headaches, detract from your appearance, and become a nuisance that distracts from everyday life. Use this guide to help you choose glasses that look and feel so great that you forget they are there. Glasses come with a variety of lens types, and manufacturers continue to make advances in lens technology. In the old days, glasses were actually made of glass, but those lenses were very heavy and would break if dropped. Today, lenses are made of plastic, which, of course, is lighter and sturdier. Many lenses are made of polycarbonate. The material is durable and lightweight, making them perfect for a variety of uses, plus people who are active and for children. Polycarbonate lenses also block ultraviolet rays, protecting your eyes from sun damage. Another type of plastic lens is known as Trivex, a type of high-index plastic lens. These tend to be thinner and flatter because of their unique surface curvature, which also corrects for minor visual distortions. However, there are pros and cons to each type, and your eye doctor will recommend one based on your prescription. If you want more sun protection, consider photochromic lenses, also known as “transition lenses,” which change from clear to a darker tinted shade when exposed to UV light. In the past, bifocal lenses were easy to spot by the clear line delineating the two sections of the lens. Today, multifocal lenses — also known as progressive lenses — look indistinguishable from regular lenses. Bifocals are commonly needed by people older than 40 who have difficulty focusing on near objects, such as when reading a book. Trifocal lenses add an additional section to enhance your ability to see objects about an arm’s length away. These objects fall in an intermediate zone that may be challenging to see with bifocal lenses. 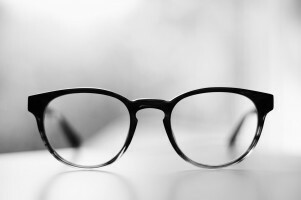 After discussing the lens material and your potential need for multifocal lenses, your optometrist can advise you on the need for lens coatings. Many people opt for a scratch-resistant coating, which adds a further layer of protection on the lens. An ultraviolet coating may also be a good choice to prevent sun damage. Also remember to ask your eye doctor about tinted lenses, which can improve the ability to detect contrast or certain colors. These days, more people are asking about lenses that block blue light, which prevents eyestrain and other eye damage when staring at a computer or other screens all day. Note that inexpensive lenses sold online often claim to protect against blue light but may not. Frames are as much about style and your personality as they are about vision correction. Spend plenty of time trying on different frames to decide what looks best with your face shape and skin tone. Weight. Frames now weigh less than ever, but some styles are heavier than others. If you are new to glasses or find them annoying, consider getting a lighter frame. Your lifestyle. Some frames twist and bend without breaking, perfect for more active people. If you’re spending most of your time at a desk, you might want more than one pair of frames. Fit. Your eye doctor will help you adjust frames around the nose and ears, but some frames are just going to sit better on your face than others. The fit is a critical factor because you want them to feel good as you wear them all day. Your glasses should not slide down your nose, pinch you, touch your eyelashes, or give you a headache. If you’re not sure about your glasses, ask your eye doctor for help. Our team loves to help people choose glasses; it’s one of the best parts of the job! Plus, your optometrist will have specific recommendations based on your prescription and eye health. Contact us for an appointment.